Things are shaken up in Central City as Weather Wizard returns and Reverse-Flash makes his move. Wow, that was a ride. “Out of Time” was a whirlwind of an episode to come back from hiatus with. It had so much going on with it, it’s a wonder it all fit into a single adventure. Almost every storyline got an update, and despite the jam-packed narrative, it all managed to flow fairly well. The two-week hiatus certainly didn’t take the wind out of The Flash’s sails. With Mark Mardon, brother of Clyde Mardon (remember him from the pilot? ), in town and on a vengeful warpath, it’s up to the team of Flash and Joe to find him and take him out. The elder Mardon brother was a great addition to Flash’s rogues gallery, with a more fleshed out backstory and even finally using the Cisco-coined Weather Wizard name (complete with Wand!). The added bonus of the VFX team once again upping their game was much appreciated, with Mardon able to show off not only clouds and lightening, but other things like creating hail and even a tsunami. There was also a few scenes dealing with the Barry/Iris romance, which weren’t terrible but felt like they bogged down an otherwise great episode. 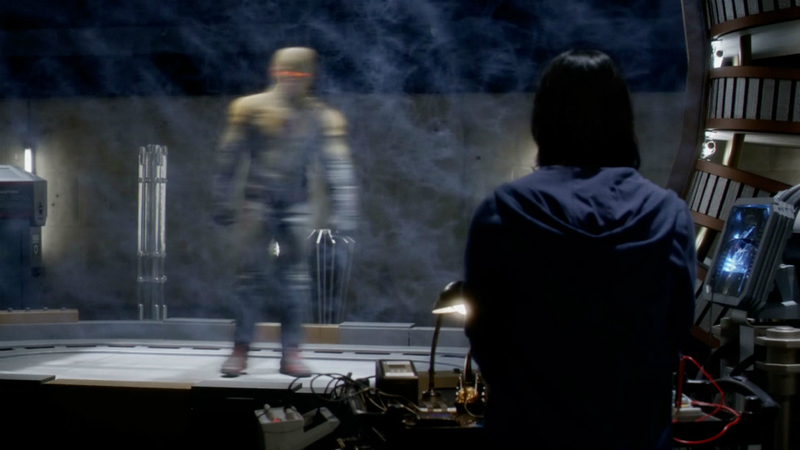 The real star of the episode, of course, was Harrison Wells, whom Cisco began seriously investigating until he found the secret of how Reverse-Flash appeared at STAR Labs in “The Man in the Yellow Suit.” With this discovery, though, came another one. Harrison Wells is in fact Eobard Thawne, who dons the Reverse-Flash persona in the comics and comes from hundreds of years in the future. While comic fans likely saw it coming, it was still a great reveal to see, and was made even more shocking when Eobard seemingly killed Cisco right after. This is the kind of thing that’s going to have deep consequences, but it may not be permanent, as the episode’s third big reveal came in the form of Barry running so fast he traveled through time. With time travel finally a reality, it’s anyone’s guess whether the events of “Out of Time” are going to stay in place for long. “Out of Time” was the best kind of return for The Flash offering up a great villain of the week in Weather Wizard and a huge reveal for Reverse-Flash—not to mention the long-awaited arrival of time travel for the Scarlet Speedster. While the Barry/Iris material wasn’t quite as up to snuff as the rest of the adventure, “Out of Time” is the sort of episode that’s going to be a turning point for the series, and it’s going to be great seeing how things move forward from here. How was the Reverse-Flash reveal? Are you excited to at last see time travel? Use the speed force and let me know on Twitter @MaxMielecki or leave your comments in the area below. Also, be sure to follow us @YouNerded.